As part of its recent expansion into Puerto Rico, Gabe’s Chemo Duck Program is excited to announce that all of our online educational materials will soon be available in Spanish. 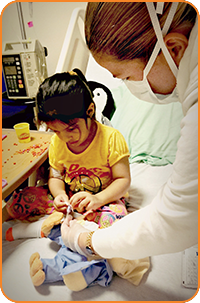 In partnership with San Jorge Children’s Hospital in Santurce, Puerto Rico, Chemo Duck will make all of its website literature, including printable activity books and guides, available in Spanish. Spearheaded by Urania Dominguez of San Jorge Children’s Hospital in Santurce, Puerto Rico, the Spanish translations are a huge step toward reaching the Latino population. Dominguez organized the translations in exchange for Chemo Ducks for San Jorge patients.